Recommended Name: � the Salzburg pattern. Around 1850 a new pattern emerged in Salzburg, stemming from a branch of the Bavarian pattern of 1810, as can be seen on a recently found pack made by Ignaz Preisinger (cf. Das Blatt No. 7). There the Daus of Leaves is Old Bavarian, but most of the pip vignettes are still present in the Salzburg packs of today. The Bavarian lozenges on Preisinger's King of Hawk-Bells are replaced by the Salzburg arms. The Emperor's crown on Preisinger's King of Leaves is replaced by a kind of cap. But the most characteristic card of the Salzburg pattern is the Ober of Hearts, wearing a two-cornered hat and seeming to draw his sword. How he came into the picture is as yet unknown. The oldest fully conforming pack was made by Anton Fuchs around 1848. Until 1880 the Obers and Unters handle straight weapons (except the Unter of Bells), as do their counterparts in the Bavarian pattern. Today they handle curved weapons, which seem to be an invention of Tietze and Schinkay. Around 1860 Salzburg cardmakers also made cards for the Tyrol, with courts reminiscent of the Old Bavarian pattern. 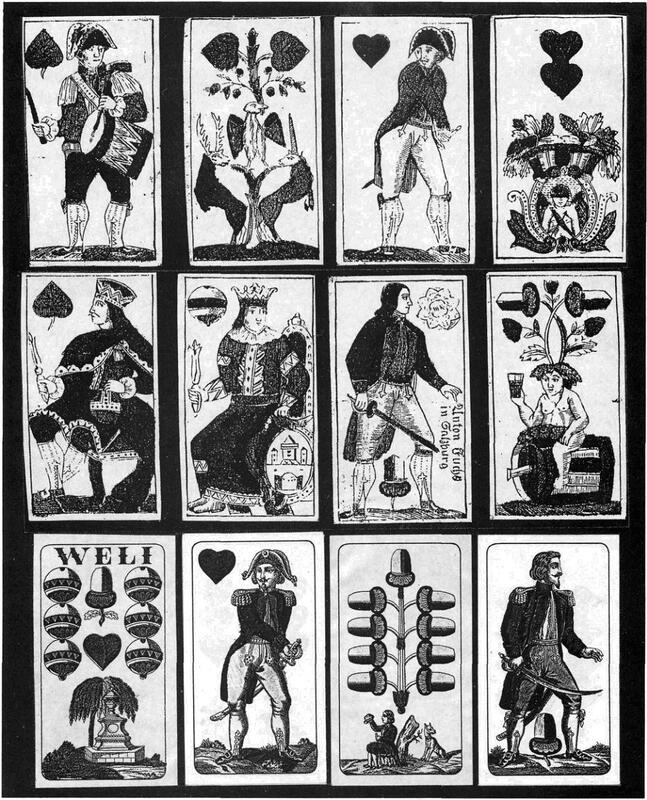 On their 6 of Hearts the Tyrolean 'WELI' appears for the first time. In 1870 the 'WELI' is fully integrated into the Salzburg pattern. About this time the Salzburg pattern succeeds in ousting the Tyrolean pattern. 36 cards with German suits: Daus, König, Ober, Unter, 10 (X) to 6. 24 cards (so-called 'scharfe Kurze'): Daus, König, Ober, Unter, 10 (X), 9. Anton Fuchs, Salzburg, c.1848; Johann Nejedly, Vienna, c.1870; Tietze & Schinkay, Vienna, c.1880; Ferd. Piatnik, Vienna, from c.1900; S.D.Modiano, Trieste, c.1900; Masenghini, Bergamo, c.1950; Edelbacher, Vienna, c.1990. DAS SALZBURGER BILD - Hexenkarten und andere Salzburger Spielkarten: Manfred Hausler and Sigmar Radau, IN Das Blatt No. 7, Munich & Berlin, 1993. DAS BAYERISCHE BILD - Studien zur Spielkarte No. 4; Manfred Hausler, Berlin 1993. Upper two rows: 'Deutsche Salzburger Spielkarten', Anton Fuchs. Salzburg c.1848. (Collection Klaus Reisinger). Bottom row: 'Einfach Deutsche', F.Piatnik & Söhne, Vienna c.1890. (Collection Manfred Hausler).